A few years back, I used to watch this show “mummy ka magic” on FoodFood TV channel. The anchor/chef would make lunch box recipes for small kids. As part of her final presentation, she would ALWAYS keep a pack of Real fruit juice tetra pack along with whatever she had prepared for the lunch box. The programme was sponsored by Real fruit juice brand. Yesterday, I came across an ad for Real fruit juice in Disney Channel and it was quite disturbing. The celebrity who was promoting it was yet another yesteryear actress, Sonali Bendre. Here’s that ridiculous ad if you want to check it out. The kid brings back his tiffin box without finishing it and gives some lame excuses to his mom everyday. So the mom says, “to make sure my kid finishes his box, I pack Real juice everyday along with tiffin and water”. She even goes on to say that a pack of Real juice gives nutrition equivalent to that of a fruit bowl (the tagline says “2X fruit requirement”). Does the brand or ad maker think that parents are stupid? Will this celebrity send a pack of Real fruit juice EVERYDAY to her children? Absolutely not. But here she is, promoting it big time. Enough of my rant. Let’s look at the facts. 1) The fruit juice concentrate is just around 12% in the pack. Is this equivalent to meeting 2X fruit requirement of a child? Since there are no legal implications in India for such tall claims, brands continue to come up with such false promises. 2) My primary concern is the amount of sugar. Nutrition table given in the pack is for 100 ml but the tetra pack has 200 ml of juice. So the added sugar is 16 g or 4 tsp of sugar. 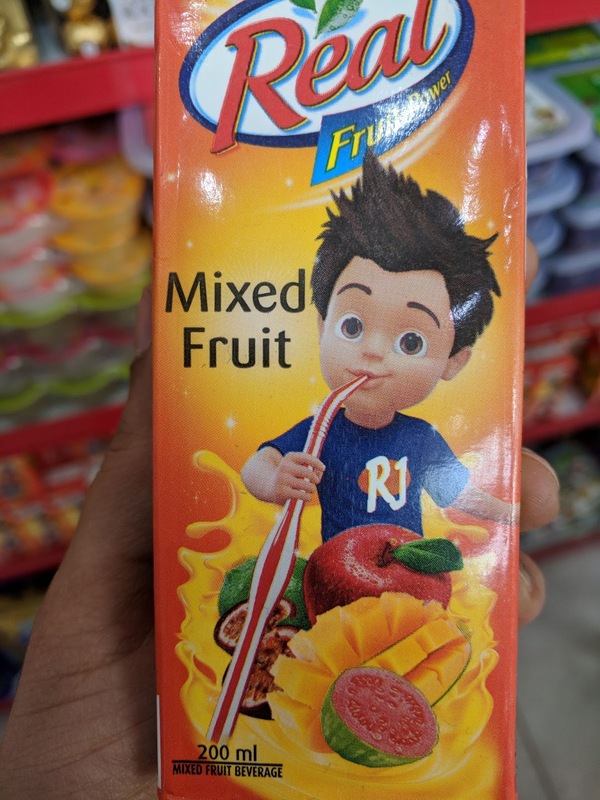 Why do kids need such heavy sugar-loaded so-called fruit juices on a DAILY basis? Schools have to be really stringent in NOT allowing such packaged foods as part of lunch boxes. 3) Look at the list of artificial additives - all the numbers starting with INS. These are added to increase the shelf life of the pack. This particular juice stays fine for 7 months as per the pack, how long does a fruit take to rot? 4-5 days, isn't it? 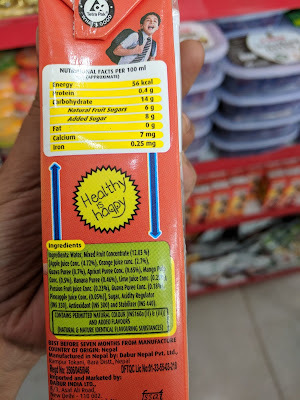 Does the brand care to list the side-effects of such ingredients IF consumed on a daily basis? 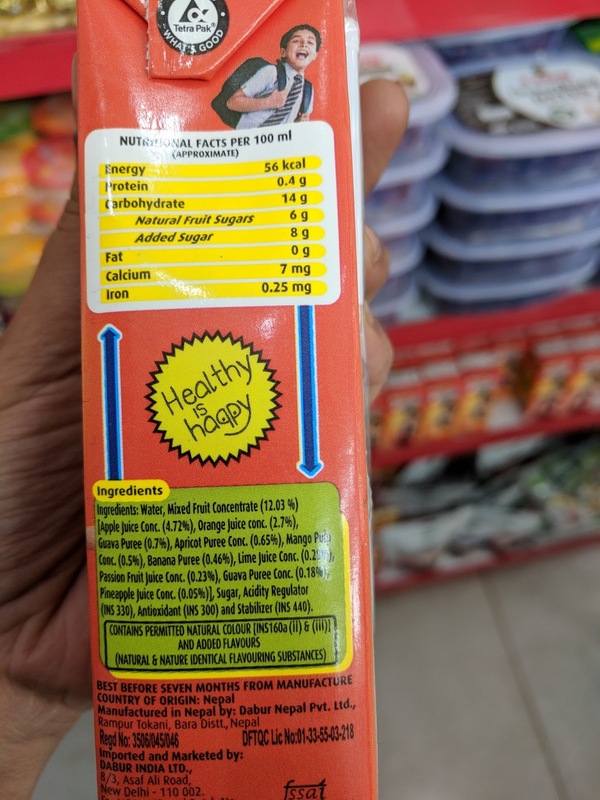 4) The brand mentions calcium and iron in the nutrition table, just to show that there is SOME nutrition using a tagline "Healthy is Happy". Notice the minuscule amounts - Calcium - 14 mg and Iron - 0.5 mg. This list doesn’t end here, almost all fruits have higher amounts of calcium and iron (not to forget the fibre, vitamins and other minerals), compared to such packaged juices that are nothing but SUGAR and additives. If your child doesn’t eat a specific fruit, keep trying different varieties. Make a fruit salad or a chaat. Be a role model and eat fruit everyday in front of your kid. Eventually, he/she will become interested. Stop stocking junk foods at home, especially such packaged juices in the fridge. Have a regular stock of seasonal fruits in 2-3 fruit baskets displayed on the kitchen counter or the dining table (not inside the fridge). If the child sees fruit, he/she would ask for it. If it is conveniently hiding in the fridge, then no one cares. All packaged food brands want consumers to get hooked onto their products on a DAILY basis. More consumption means more profits. If you notice, every brand wants to be part of your child’s daily routine - starting from breakfast cereals, tomato ketchup, cheese, jams, packaged juices and what not. Let’s be extremely vigilant about what we add to our shopping cart and to our children’s meals.